Have you ever strolled passed a popular retail store and seen a queue of people as far as the eye can see? If so, then you have come in contact with what they call a Hypebeast. To break it down in simple terms, a Hypebeast is a label given to an individual who is deeply immersed in keeping up to date on fashion trends and heavily invests in obtaining rare/hard-to-get/exclusive item of clothing or footwear. The Hypebeast culture has become extremely deep-rooted in the streetwear fashion, so much so, that a whole new universe has manifested. But literally, a stock market for clothing and footwear of social value were the average schmuck can buy a pair of sneakers and possibly sell it for twice or three times the retail price. But beyond the monetary value, the Hypebeast culture has become a safe haven for individuals to express their scene of style and be praised for their outlandish combination of brands and items. This way of life has even transcended to be a fun loving family activity. 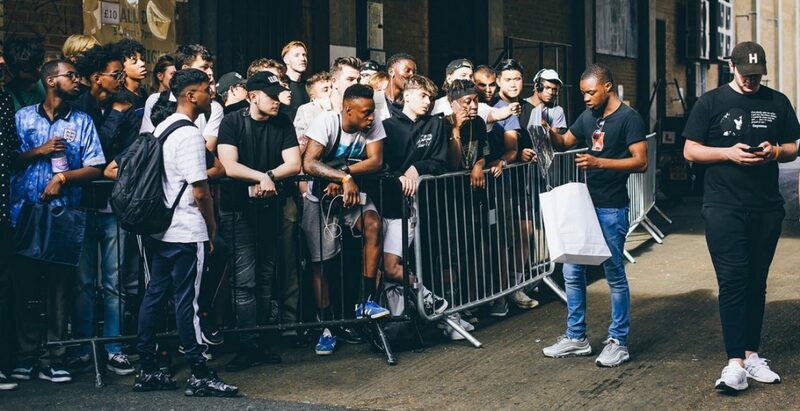 I kid you not I’ve seen parents take their children to sneaker conventions to then hand little Jimmy £500 to buy a pair of sneakers he doesn’t currently have in his collection. Bruh! What makes a person a Hypebeast? You could be a Hypebeast and not even know it. This is hard to define but I will list some common traits to those labelled as “Hypebeast” all predominantly share. Attend sneaker conventions – if you have attended or regularly attend events based on streetwear fashion. Exclusive raffle draws – if you keep a keen eye out for raffles or prize draw system for exclusive streetwear items. Willingness to queue overnight – this is for the super advanced Hypebeast who will dedicate days and nights to patiently wait and queue to get their hands on a pair of sneakers. Associate your fashion to your social relevance – If you’ve tried to outdo your outfit from the previous day to be seen as the streetwear fashion God amongst your peers. Dress for a reaction – dress for the reaction “Yoo you see those”, or “Where did he/she get those from”, or my personal favourite “ I see you in those/that [insert brand of choice]. Conversations revolve around streetwear brands – if every other word that leaves your lips is a streetwear brand or a pair of sneakers, I think we can both agree that you’ve been a Hypebeast for a while. See clothing and sneakers as collectables – Again this is for the advanced Hypebeast individuals, but if you see your sneakers like a solid bar of gold, and take every precaution known to man to preserve their condition, it’s fair to say, you know what I’m about to say. You know more than the average schmuck – have you ever caught yourself explaining something to someone about why a pair of sneakers are socially relevant? Phew! There’s a long list for you guys to get started on. But if you’re looking for more, here is a great place to see more brands.